Thanks to all of you who have signed Seventh Generation's petition for safer chemicals at FightToxins.com. As of this evening, we're less than 7,000 signatures away from 100,000! 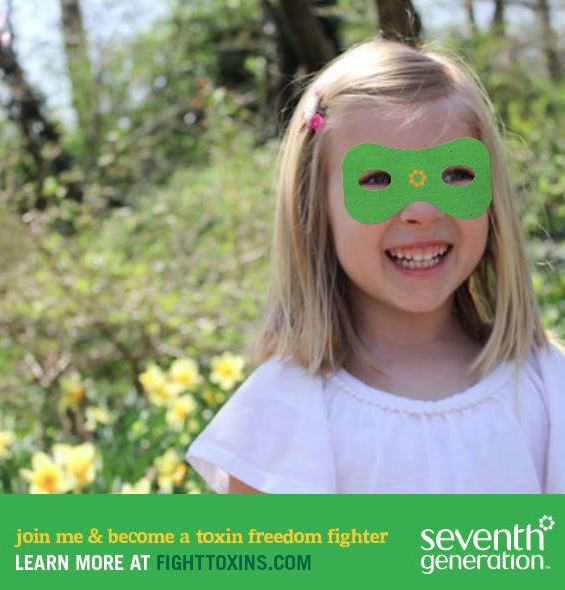 To recap, the goal of the Toxin Freedom Fighters Campaign by Seventh Generation is to obtain the attention of Congress. And here's why: believe it or not, but the Toxic Substances Control Act was passed in 1976 and has never been updated, which is beyond ridiculous. And unsafe. And we can do something about it by signing this petition. Like I mentioned in my original post, I'm beyond thrilled to be working on this campaign. On April 30th, Seventh Generation will present our signatures to Congress and urge lawmakers to put chemical reform on their agendas. By signing the petition, we have been given a voice and a chance to be a part of real change. And I love that Seventh Generation is passionate about this subject, in addition to making the best product line out there that's chemical-free yet works great. Oh, and if you've got a little freedom fighter at home, wouldn't he/she look cute with a mask on like Millie? After signing the petition, check out "Mask Yourself." Less than 7,000 signatures away from 100,000. If you've already signed the petition, please pass it on to family and friends. Let's show Congress there is strength in numbers.